The Massoth pulsed smoke generator for round boilers may be retrofitted in most G scale steam locomotives. It combines pulsed steam and cylinder steam functionality in a single unit. With an outer diameter of only 30mm, the unit can be easily installed in smaller G scale locomotives such as the LGB Stainz and Franzburg. 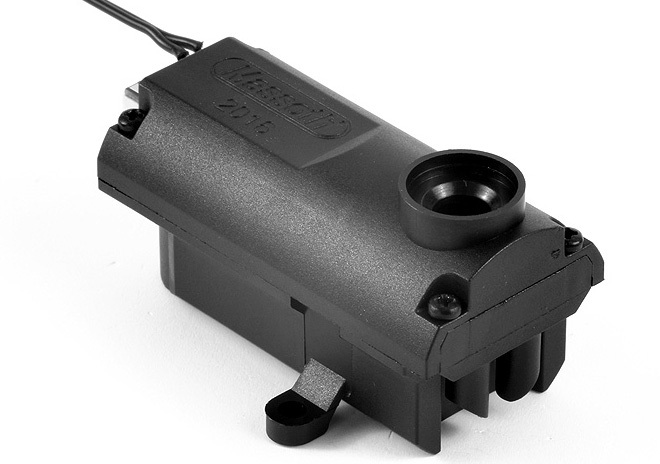 The Massoth Pulsed Smoke Generator for Round Boilers connects directly to track power and operates with DCC speed steps, hall-effect sensor, or clock signal from a decoder. With a newly designed fan and optimized airflow this smoke unit makes more smoke than ever. Overheating and dry-run protection are integrated. The pulsed smoke generator is equipped with a fully integrated decoder that features a standard loco address and a separate programming address. POM programming of the smoke generator is thus possible. the smoke generator's heating element and fan may be independently activated and controlled for optimum smoke effects; several CVs are available for setting temperature of the heating element, preheating of the element, and various fan speed. Load-dependent smoke generation is possible when the generator is connected to the SUSI interface terminal of a Massoth eMOTION decoder.